The V-COD is based on the fabulous, water cooled Harley-Davidson V-ROD. 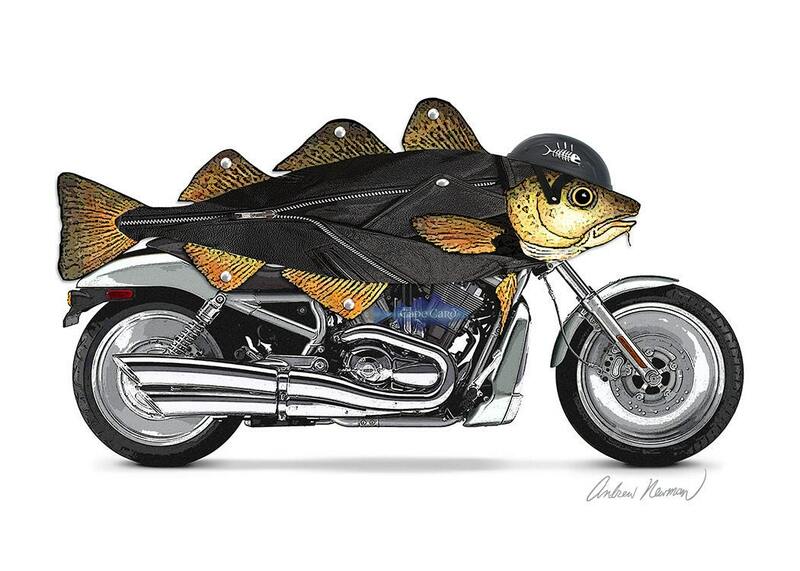 The cod is wearing a stylish leather jacket and a helmet with a skeleton. The dorsal and pectoral fins have stainless steel studs. Makes a great father's day card. The card measures 7x5 inches. It is printed on heavy matte stock and packaged in a clear cello sleeve with an envelope. The V-Cod is also available here as an 11x14 print, and in my http://zazzle.com/capecard shop on a variety of items. Illustration copyright © 2011 by Andrew Newman. All rights reserved. The Cape Card watermark will not appear on the actual card. So cool! I hope he frames this one!